Successfully Added 1 DIN Android 4.2 Car DVD Player for BMW E39 - 7 Inch Touch Screen, Rockchip Cortex A9 Dual Core CPU, GPS, 8GB Internal Memory to your Shopping Cart. 1 DIN Android 4.2 Car DVD Player has been specially designed for BMW E39 models as it boasts a 7 Inch Touch Screen, GPS and 8GB of Internal Memory for a real upgrade to your vehicles. For all owners of BMW E39 cars, you will find that your existing stereo system just does not cut it especially now we have smartphones and iPads. You can make things easier and much more convenient by replacing your existing unit with this Android 4.2 car DVD player that has been purposely designed to fit BMW E39 models. Fitting snuggly into the 1 DIN size unit on your car’s dashboard, you will get a completely new system that will really enhance your driving experience in every way. Firstly, this car DVD player comes with Android 4.2 Jelly Bean as its operating system, so straight off the bat you can create your own lay-outs as well as download apps from the wealthy Google Play store. Connect to the internet by either using Wi-Fi or via a 3G dongle, and once online you car surf all your favorite websites and even update your Twitter or Facebook. The display is an attractive designed 7 inch touch screen so you can have full control over navigation and what you want to select. 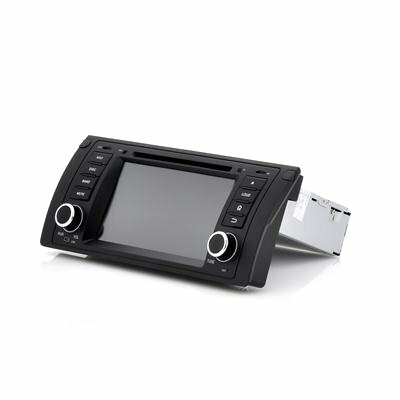 Never worry about performance or if this car DVD player can handle the task as it has a powerful Rockchip 3066 Cortex A9 Dual Core processor that ensures all the operations, tasks and general usage is dealt with efficiently. Plus when it comes to long journeys you can use GPS to get your there safely and fast because with the GPS you can use lane assistant, points of interest as well as other features to really improve the drive. Save your entire movies, music or other data on the 8GB of internal memory that this car DVD player has or use the accompanying cables to connect your iPod so you can play your entire music library via this car DVD player. This car DVD player is applicable to BMW E39. "BMW E39" and all models of BMW cars are trademarks of BMW Inc., registered in the Germany and other countries. This and other similar products are not claimed to be an authorized or branded product by BMW Inc. These products and our company are not affiliated with BMW Inc. or endorsed by them in any way. Our products are unbranded / white box and are sourced with full respect for Intellectual Property Rights - you will never be sold a fake brand or misrepresented product by Chinavasion.com. Very good car audio, perfectly fits into E39. It's worth the money you are paying for.